Media captionSimon Allen: "We'd like to see this upscaled to the whole of High Mountain Asia"
The flood danger posed by glacial lakes across the Tibetan Plateau has been assessed in the most comprehensive study of its kind so far. Swiss and Chinese scientists looked at 1,300 of these water bodies that have built up in front of ice streams and which are dammed by rocky debris. The fear is that these lakes can overtop their barriers and send floods downstream that overrun settlements. The team has found 210 (16%) to have the potential to threaten communities. It is information local decision-makers can now use to prioritise strategies to mitigate the risk, says Simon Allen, whose group at the University of Zurich worked alongside colleagues from the Institute of Tibetan Plateau Research in Beijing. 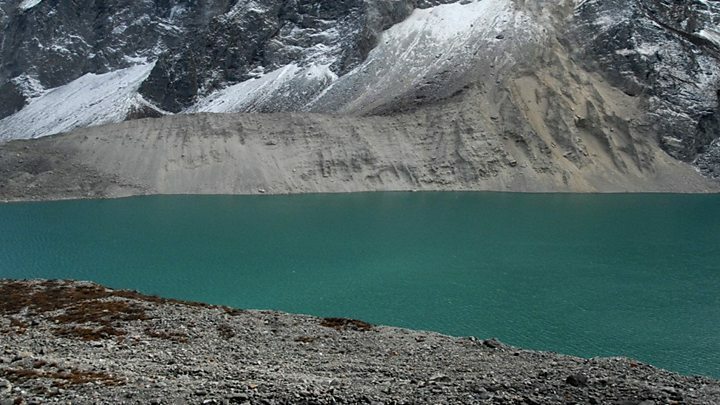 "One of the key aspects of this study is that we identify important situations where lakes have developed in China, but most of the threat is downstream in Nepal, across the border," he told BBC News. "We call these 'transnational boundary threats'. So, these are important because it is much more complex to manage the response of two countries." Dr Allen was speaking here at the European Geosciences Union General Assembly. He said the assessment carried out in the central Himalaya should be repeated across High Mountain Asia. There are several mechanisms that can generate a Glacial Lake Outburst Flood (Glof). But one of the most common in the Tibetan region sees an ice avalanche come down the steep slope of a glacier into the lake to drive a large wave over the dam. It was the potential for just such a scenario that the team's automated satellite survey considered. But, crucially, the reality of humans actually being in the way of any flood was also taken into account. "A lot of the unstable lakes are far too remote to affect people," said Dr Allen. "Only 210 out of these nearly 2,000 lakes could potentially threaten human settlements. So, this is already useful information for policymakers - they can then focus on these lakes. These are the hotspots of risk." Top of the list of the team's 30 most dangerous lakes is Cirenmaco, which has experienced three major disasters in the past 100 years. In 1981, 200 people died in a lake outburst. Second on the list Galongco, a lake with 10 times the area of Cirenmaco. The scientists have recently been to Galongco to measure its depth, to work out a volume. "These type of studies have to be repeated every five or 10 years because these lakes are growing and new lakes are formed all the time," Dr Allen told reporters at EGU. "We would like this study to be replicated across High Mountain Asia - in countries like India and Pakistan - because there is a lot of money going into Glof projects, but this kind of study should be the starting point so that we're not wasting money in the wrong regions or on the wrong lakes."